Reason 8.2 is a free update for version 8 owners. For those who just can't get on with whole numbers, Propellerhead Software is releasing another point-update for Reason 8 today. The agenda isn't astounding, but the tweak is free for R8 owners. Integration is the name of the game, most notably with your own computer and the world wide web, as Reason's installation and update procedure become more automated. That means no more dragging PKGs or downloading bulky installers, as the whole process should be taken care of for you in the background. Reason 8.2 also integrates slightly better with bits of itself - adding a Revert browsing feature - and integrates better with your eyes, providing more colours to use in the sequencer. Better distinction of new tracks with garish pink, anyone? 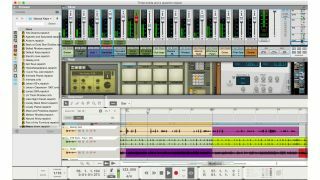 The update also introduces "expanded Remote support for Redrum," amongst other things, and is ready to roll with Propellerhead's online music-making collaboration service. Reason 8.2 is free to registered Reason 8 users, and can be bought for €405 (or €120 for Reason 8 Essentials). You can upgrade from anyprevious version of Reason for €129. Check out the Propellerhead website for more info.